Pears’ soap has a well-deserved reputation for being a high-quality soap. It also enjoys the notoriety of being the first mass marketed transparent soap. Originally billed as the “English Complexion Soap,” Pears’ soap has been a leading contender in the bath soap arena for more than 225 years. As enduring as the soap itself has been, the vintage advertisements for Pears’ remain hugely popular as decor in homes today. To understand why a fondness for their ads has endured in peoples’ hearts, we’ll take a look at the Pears’ Soap success story. 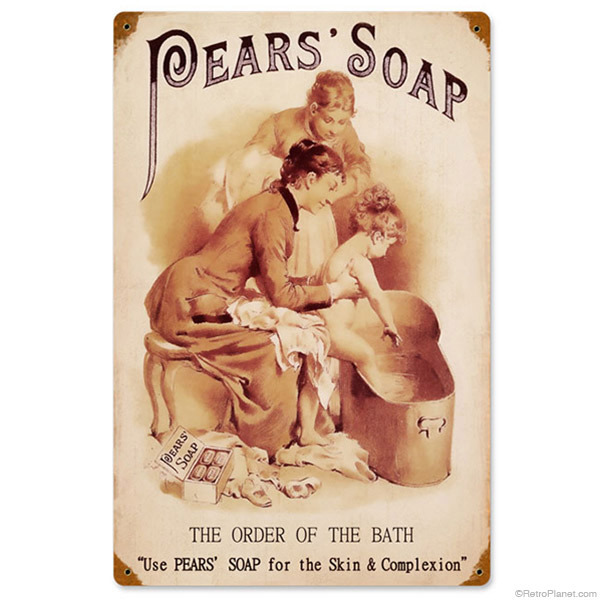 Pears’ Soap was invented by an enterprising man who saw an opportunity to fill a void in the health and beauty market. Andrew Pears was born circa 1770 in Cornwall, England. He trained as a barber and moved to London in 1789. There he acquired a clientele of wealthy Londoners to whom he sold skin lightening powders, rouges and creams. Many customers came to Pears looking for something to correct the dryness left by harsh soaps—few options were available for face cleansing at the time. Further damage was caused by arsenic and lead based creams used by women in pursuit of alabaster complexions that were considered a sign of wealth and refinement. Seeing a need for a gentle cleaning bar led Pears to develop a less irritating soap. His process was to boil the ingredients for long periods, until all impurities and irritants were removed. Then a delicate perfume was added that smelled of English garden flowers as well as rosemary and thyme. The result was a translucent bar that was then aged for two months. The aging process resulted in a greater lathering ability than other soaps as well as longer lasting bubbles. The two-month aging stage is still used when making Pears’ soap today. Early Pears’ Soap marketing was directed at the prosperous middle class and featured everyday domestic scenes. Andrew Pears’ new soap and its unique benefits became the most popular of soaps among the wealthy in London, and eventually, many of the nobility. In 1835 Andrew Pears added a partner to his soap business, his grandson, Francis Pears. More concerned with maintaining the quality of their soap than selling more of it, Andrew and Francis Pears were joined in 1865 by Francis’ 24-year-old son-in-law, Thomas Barratt. Barratt focused on the advertising and promotion of Pears Soap. Barratt devised an innovative advertising campaign for Pears’ Soap, using a variety of methods available to him at the time. These included newspaper ads, promotions and testimonials from scientists and celebrities. Barratt also used creative techniques, such as purchasing 500,000 French coins and having the Pears’ name stamped on them. The coins were then circulated as British currency, against which there were no laws it at the time. This marketing technique resulted in a lot of publicity, but also in a law being passed to make use of foreign currency in England illegal. Original paintings were purchased and featured in Pears’ Soap advertisements. Young children and animals were a favorite theme, in order to generate sentimental appeal. Barratt purchased original artwork from artists for his advertisements, including the well-known “Bubbles” by John Everett Millais, which he had modified to include a bar of Pears’ soap. This was not very well received by the artist, but he had sold the rights to his painting to Barratt, so there wasn’t much he could do about it. Barratt also acquired Frederick Morgan’s “His Turn Next”, which is probably the most widely reproduced Pears’ advertisement today. Ads like these were directed at a middle class that was becoming increasingly more prosperous, with money to spend on items like luxurious toiletries. Barrett’s approach worked, and people loved the Pears’ advertisements—then and now. The artwork, in which sentimentality was heavily emphasized, had mass appeal. The artwork used most were genre paintings featuring very quaint domestic scenes, many of which depicted young children and animals. Today people still enjoy these domestic scenes as well as the nostalgic look of the Pears ads. Reproduction vintage advertising is a great choice when looking to add vintage style to home decor. 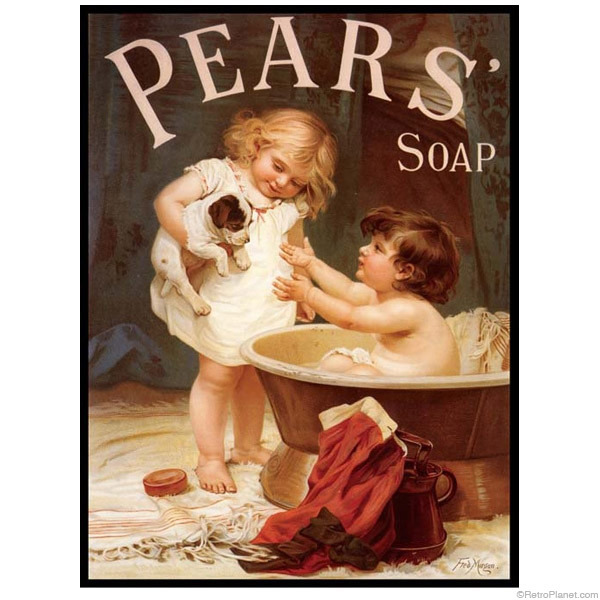 Vintage soap advertisements in particular, are a beautiful way to decorate a bathroom or laundry room.